Holland, MI (June 2, 2011) – After a solid 2010 season driving the Allstar Performance, Venom Energy sponsored PRO-Light Ford Ranger, Ross Hoek is looking to take that final step towards capturing the championship title. 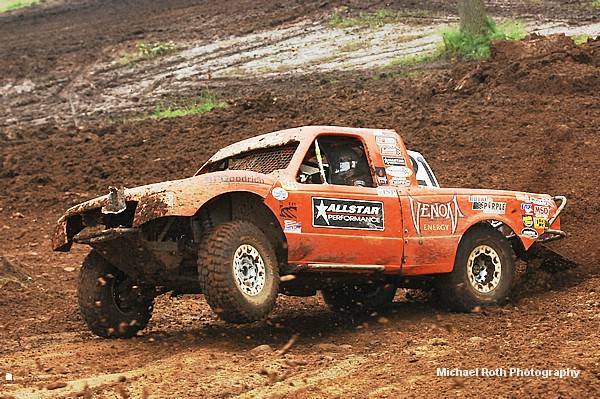 The opening weekend of the TORC Series proved the Holland, Michigan native was one of the stars of the class. The Traxxas TORC Series built a very interesting one mile long track that ran through the same valley as the most iconic outdoor motocross facility in the United States, Red Bud MX. The layout had large elevation changes, a step-up jump, a large whoop section, a very technical infield section, and a fast and rough back straightaway that ran along an orchard. Needless to say, the track was extremely technical leaving little time for drivers to catch their breath. The week leading up to the event saw several bands of thunderstorms move through the area as well as during the actual race weekend. 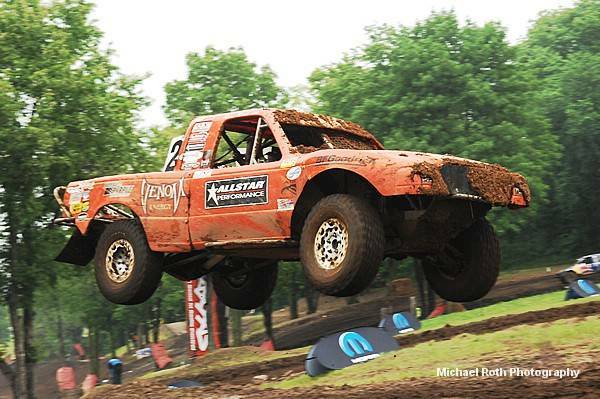 The weather conditions caused TORC to change the race schedule and actually postpone several class races to a later date. Somehow PRO-Light was the only group that completed both rounds of racing during the weekend. The opening weekend of racing saw seventeen PRO-Light competitors come to Red Bud to contend for the race wins and the championship. After a year of experience in the V8 powered PRO-Light class that include five top-3 finishes and placing fourth in the 2010 championship, Ross Hoek is a serious contender for the 2011 championship. Saturday’s Round One race had the #21 Allstar Performance, Royal Purple, Venom Energy, BFGoodrich Tire, Ford Ranger starting in the third row. The seventeen truck field was really stacked with talented experienced drivers as well as several newcomers to the PRO ranks. The combination made for a very entertaining race for the Red Bud crowd. The technical layout of the track also lent itself to some very aggressive driving by many of the competitors. The start of the sixteen lap affair saw Hoek make a couple of quick passes within the first two laps. It seemed like the majority of the top eight trucks ran nose to tail and when one driver would make any slight miscue two racers take advantage of the situation and move up the running order. At the halfway mandatory yellow flag lap, the Allstar Performance Ford was running well in fourth place. Before team went back to work on the truck. Ross, who lives just up the road in Holland, Michigan, invited family, friends, and race teams over to his pit area for a pig roast. In just a few hours the 150 lb. pig along with salads and sides were enjoyed by all. Once dinner was complete, Ross and his team worked on the truck’s suspension set-up as the track really got rough as the laps went on. Again the rains came through the area late Saturday afternoon and throughout the night. Somehow the track was ready for racing by lunchtime. Once again a large turnout of first-time short-course spectators found its way to the Red Bud hillside. Ross was starting in the middle of the starting grid again on Sunday. When the group went to green flag racing, the condition of the track rapidly deteriorated. 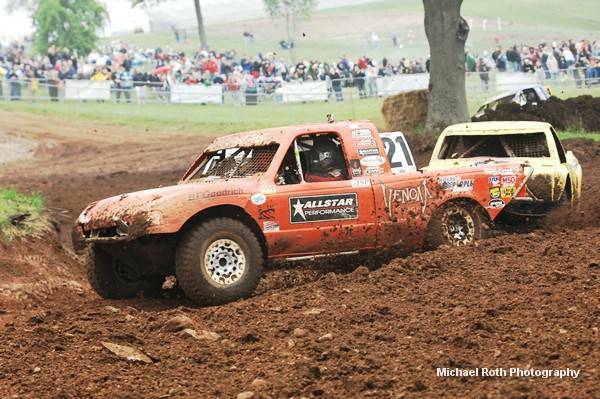 With much of the muddy top soil plowed off the course, the trucks were now racing on sand and gravel. Huge ruts and holes appeared throughout the course. At one point in the race three trucks were stuck trying to go up the big uphill on the backside of the court. Nearing the half way mandatory caution Ross found himself running in the fourth position when the truck caught a rut and Ross ended up on his side and on fire waiting for the track crew to get him back on all four wheels. Once back on his BFGoodrich Tires, Ross refired the motor and headed for the pits so his crew could tell if the truck was able to continue in the race. The slow roll on its side caused little damage, so Ross went back out to finish the race. At the checkers Ross finished one lap down in eleventh place. Ross Hoek Motorsports has several marketing opportunities available for the upcoming 2011 season.